JACKSON, Tenn. -- Matt Moore's momentum came to a screeching halt in the bottom of the first inning of the Southern League All-Star Game. Steffan Wilson chased Moore with a two-run double that capped a four-run rally and sent the North Division All-Stars on their way to a 6-3 victory over the South at Pringles Park. Moore, MLB.com's preseason No. 27 prospect took the mound five days after pitching the first no-hitter in Montgomery Biscuits history. But he retired only two batters and was charged with four runs on three hits and a walk. "It was great to start and pitch against the best hitters this league has from the North Division," Moore said. "Now we're getting ready for the second half to start. We finished the first half well with a lot of energy and now it's up to us to pick up where we left off and try to keep it up." Minor League home run leader Paul Goldschmidt of the Mobile BayBears had staked Moore and the South to an almost instant lead with a two-run blast in the top of the first. But Jake Shafferdrew a leadoff walk in the bottom of the inning and moved up on a groundout by Jackson Generals teammate Kyle Seager. Matt Spencer of the Tennessee Smokies singled to put runners on the corners and Scott Van Slyke of the Chattanooga Lookouts blopped a single to right to halve the North's deficit. Spencer stole second, then scored after Van Slyke swiped second and Birmingham Barons second baseman Tyler Kuhn dropped the throw. Moore hit Tennessee's Steve Clevenger and Wilson followed with a double to right field to put the North ahead for good, 4-2. Luke Montz of the Jacksonville Suns, who won Monday's Home Run Derby, singled home a run in the third to get the South within 4-3, but Jackson's Wily Peralta stranded two runners in scoring position by striking out Montgomery's Daniel Mayora. That set the tone as nine more North Division relievers combined on six shutout innings. Jackson's Andrew Carraway, the league leader with a 2.41 ERA, fanned one in a perfect fourth for the win. The North got some breathing room in the sixth as Tennessee's Blake Lalli ripped an RBI double and scored on a throwing error to cap the scoring. 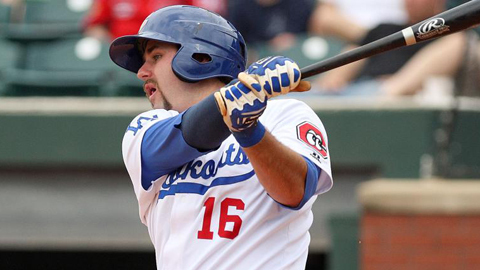 Van Slyke received the Top Star Award after going 2-for-4 with an RBI, a stolen base and two runs scored. "There's a lot of talent in this league with a lot of guys that will be in the big leagues in the near future," said North manager Jim Pankovits of the Generals. "A lot of that talent showed tonight with some of the performances we saw out there." Wilson produced one of those performances by collecting three hits, including the key blow in the first. BayBears outfielder A.J. Pollock went 2-for-3 with a walk and two runs scored for the South. Pankovits employed every player on his roster, giving each the taste of playing in an All-Star Game. "It's about having fun and taking pride in being named to an honor like this," Pankovits said. "This is the future of baseball and there were plenty of scouts out there watching what we have coming up in this sport. "Judging from what I saw out there tonight and what I've seen while coaching in this league for the last couple of months, we've got some good players moving up through these organizations. I enjoyed having some of these young guys in my dugout instead of in the other dugout for a change." Brandon Shields is a contributor to MLB.com. This story was not subject to the approval of the National Association of Professional Baseball Leagues or its clubs.